Tea Masters: What makes puerh so special? What makes puerh so special? One of the things I haven't been able to find anywhere is where do the microbes in Pu-erh tea come from? I have read that they are added during processing and even heard that they naturally grow on the tea. If that is true why do they occur in pu-erh and not in other teas? I won't be able to answer the 'microbe' question very precisely. Microbes, by definition, are all around us, but can't be seen. So microbes are there when the plants grow and in the puerh factories. But the question I sense behind is: why is puerh so special that it will evolve over time? And microbes are not the answer to that question. Luckily, Teaparker just talked about it last Sunday at the Taipei Story House. First, to understand puerh, we must see wild puerh trees in their natural habitat in the mountains of Yunnan, at over 1700 meters altitude. Here is a picture of the oldest tree, 1700 years old and over 30 meters high. 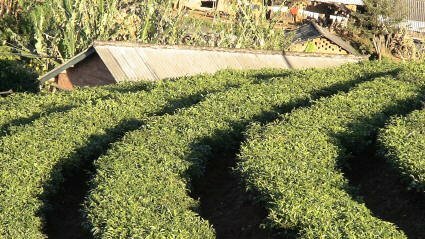 Other tea trees are also able to survive in the wild and grow quite old, but puerh beats them in terms of size, longevity and amount of polyphenols. The last point is quite important: puerh tree leaves contain much more polyphenols than other tea leaves. Not only are polyphenols healthy, but they are what gives tea its nice fragrance and mouthfeel. 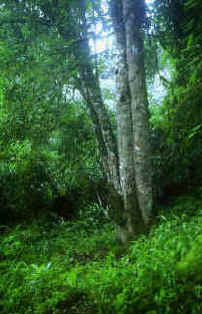 Wild puerh trees get their strength from the rich forest soil and their long roots. A diverse and luxuriant flora adds to this strength. For instance, you can see lichens grow on the puerh trees. This foam looking mushroom is an indicator of an environment that is clean and not polluted. Why? Because it accumulates minerals (from the rain) to grow. If heavy metals are present in the rain, then the lichens die. The leaves get also bitten by insects (a good sign to see if your puerh is naturally grown or not). What doesn't kill it makes it stronger. There are many different kinds of wild puerh trees in Yunnan. With its 394 000 square km, Yunnan is as big as 3/4 of France. But what these big leaves/small leaves trees have in common is a formidable strength to grow naturally in high altitude. This is what makes their leaves so enduring. The big majority of puerh on the market (over 95%) comes from fields like these below: These are man planted and managed tea plantations that use seeds of puerh trees, but planted at lower elevation in fields. The DNA is the same, but the environment is very different. Puerh trees need a lot of nutrients to produce their polyphenols. In such plantations, it's quite obvious that fertilizer needs to be added. The lower elevation will also reduce the cha qi of such leaves. You can still find very decent plantation puerh if the fertilizer used is natural and if the process is handled correctly (Using the traditional method of sun drying the leaves, for instance). However, such puerh will never come close to real, well made, wild puerh. Conclusion: the magic of puerh comes from inside the leaves, which are a product of the environment. It doesn't come from the microbes or a specific process. Loose puerh will age differently, but is as tasty as compressed puerh. Acknowledgement: The first 2 pictures came from this website. 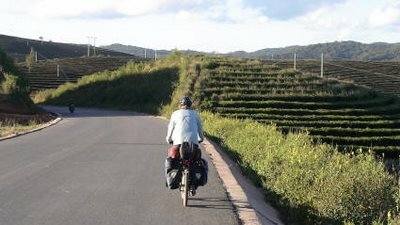 The puerh fields came from Downtheroad. 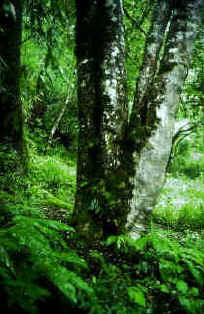 You can also check this page to see more wild puerh trees. je rêvais de voir enfin ces plantation de PuEhr... thé d'une certaine excellence! You often talk about teatrees race, trees for puerh, trees for oolong, etc... But it is the same race for every tea : camelia sinovensis. So, what's making the difference, apart from altitude, atmospheric condition, soil, and so on? Thanks pip for your first comment! So, while most Chinese teas are camelia sinensis, there are many varietions in this family. However, the tea family doesn't stop at camelia sinensis. For instance, you also have Camelia Assamica (for India's Assam tea). 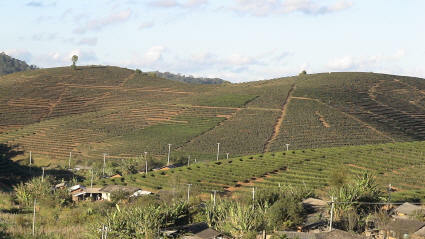 And for puerh, there are different trees as well: Camélia tachangensis and Camelia taliensis to name a few. But here we enter botanical studies! Yes, you're right, there are the varietals. I was not thinking about that, even as I was thinking about the similarities with wine (soil, atmospheric condition, etc...). However, I didn't know there were other teatrees races, thank you for the information. Thank you for your detailed answer. Given an unmarked teacake without any prior information; how would you go about deciding whether it contains wild or cultivate pu-erh leaves aside from size? This is the best explanation I've seen. Thank you for being so clear! Good question. Difficult answer. Besides, wild puerh is not a guarantee for good puerh. If the process is wrong of if the leaves are low grade, then you may still end up with a bad brew. So, best is to use all the information: sight, smell, taste, touch to determine if it's good or bad. Pu-erh (also written Puer, Pu-Er, Puerh) is China’s great mystery tea famous for its heath giving benefits, very low caffeine levels and rich, unique and comforting flavour. The secret is in the aging process. ‘Finished’ or ‘cooked’ Puerh is made from freshly picked leaf, to which local spring water is added, and the tea ferments at less than 40 degrees for 40 days. The tea is then allowed to dry and age for many years. The secret is the addition of an ancient bacterial culture, by adding old, ground Puerh during the fermentation process and ageing in conditions that are not too hot and humid. ‘Green’ or ‘raw’ puerh is compose of fresh leaf, withered and compressed into cake form and allowed to aged in open air conditions. The moisture absorbed from the air makes the tea aged and ferment slowly over time. Green puerh is more astringent and lively than finished puerh unless it has been allowed to aged for many years. 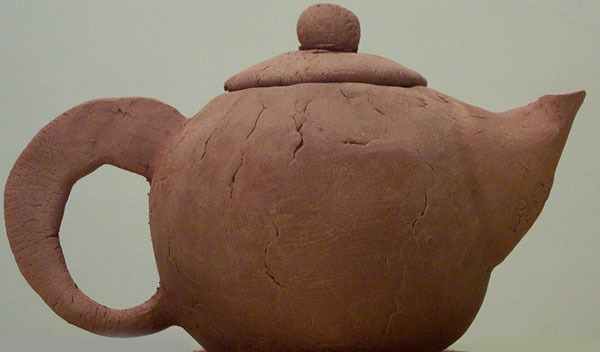 The Chinese believe that Pu-erh has even greater health properties than other teas. From a Chinese Medical point of view, Pu-erh invigorates the Spleen, disinhibits dampness, clears Stomach heat, descends Stomach qi and counteracts alcohol toxins. Pu-erh's ability to aid fat metabolism has lead to claims that it can assist in weight loss regimes. Antioxidants called flavonoids, found in both green and black teas, are considered to be responsible for the reduction in blood pressure, hardening of the arteries and the amount of LDL or ‘bad’ cholesterol in the blood stream found in tea drinkers (Preventive Medicine 2002;36:64-70). It says that old grounded pu-erh is added to the fermentation of cooked pu-erh to serve as the microbial enhancement. If I remember correctly on www.pu-erh.net, Mike Petro identifies the individual microbes and explaines how each microbe is believed to sustain the believed claim. Do you have any additional information on this procedure. It almost look like this can be supportive of some of the health claims of pu-erh. I'm a tealover from Indonesia. After long holiday, I found my triglyceride level is high. Currently I drink tuo cha after meals and before bedtime. And it does lower my cholesterol. Tea factory in Yunnan use aspergillus in order to ripe high quality puerh. Alternatives like penicillum and wide range of microflora, are sometimes found in puerh. The addition of old puerh to the new is also a way to speed up the aging of a beeng so that it can be quickly sold at a higher price by claiming it's an older puerh. I prefer the natural way of using leaves from the same year and area in a puerh cake. Again, microbes happen in puerh, but it's not the main reason why it's different from other teas. 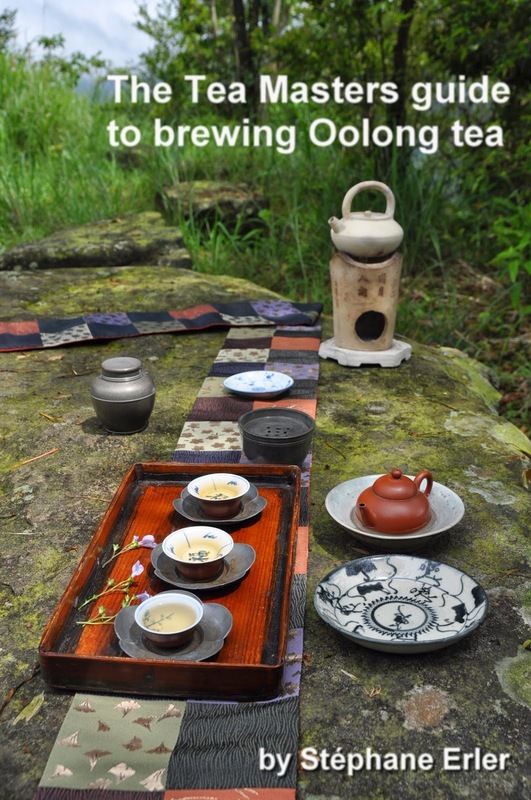 Otherwise farmers or merchants would add those microbes to oolong or green tea to copy puerh. Is tea grown in Bali, if so tell me about it. 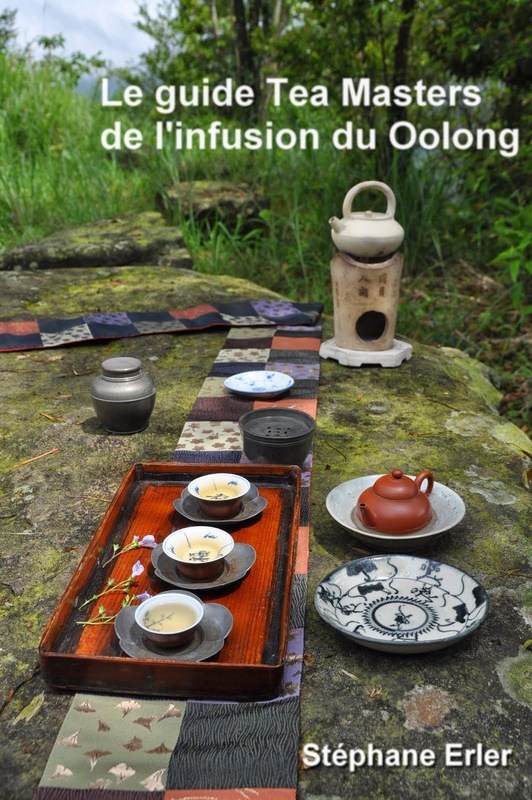 Stephane, according to Chen Chi Tung in the first issue of the art of tea magazine, he mentions that there maybe some adverse side effects to drinking alot of new Sheng Puerh may have some adverse side effects such as a loss in calcium, heart palpitations, stomach ulcers and insomnia. Can you comment upon this ? Puerh is a very concentrated and strong tea. I have experienced insomnia several times after drinking sheng puerh (even from 1985!) And I do several puerh pros who only drink old or cooked puerh. But another reason is also that most young puerh is not high grade. This rough tea is rough on you. However, a high grade, wild puerh that has been correctly processed is still very concentrated, but its energy is positive on the body. It takes little of such good puerh (and long infusion times) to make an excellent cup of tea. Thereby, you also reduce the intake of substances that can upset your body. (For low grade puerh, one usually uses a lot of leaves and shorter brews). A Taiwanese Tea Merchant mentioned that Wild Pu erh was not actually produced until around 1970. Can you comment about this? Just before 1970 was the cultural revolution. At that time, I heard that very little of anything was produced in China. Focus was on basic necessities, not on 'imperial' grade tea! Or would have been branded a reactionary! More seriously, I don't think it's likely that Yunnan tea farmers would not use leaves from wild trees. Normal evolution is to first gather what nature gives you. And when it's not enough, then one turns to more systematic and intensive farming. Anyway, I think there is no way to generalize about the origin of the leaves. Hi Stephanie. My name is David and I am from the states (California). I watched a documentary on Puerh Tea and figured that because i like tea so much i might as well try it! So far i bought some tea puerh tea online for 30 some odd dollars and its a blacker darker tea that comes packed in paper wrapped balls. i was wondering.. is there a distributor that has good prices that i could possibly contact or that you would like to refer me to in order to get grade A puehr tea? i would also need it shipped to California. ill be checking daily on your tea blog to see if you have answered me thanks! Please send me an e-mail at: stephane_erler@yahoo.com and I will send you a price list with nice puerhs that I have selected. May the tea spirits be with you this Halloween!